Welcome to Courier Invoice. Developed for in-house use by R.J. 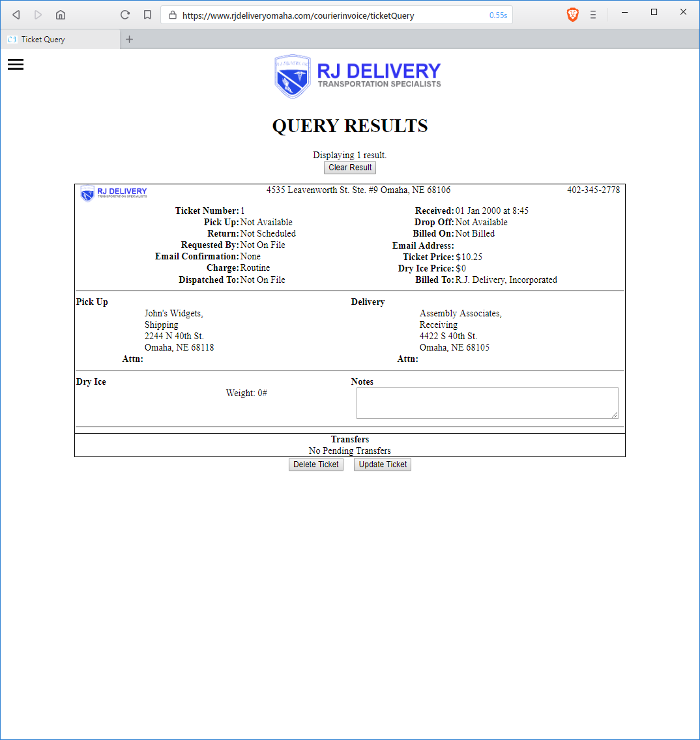 Delivery, a company with 40 years experience in small package delivery in the Midwest United States, Courier Invoice is a highly configurable web application for small to medium sized courier companies to manage clients, delivery tickets, and invoices. 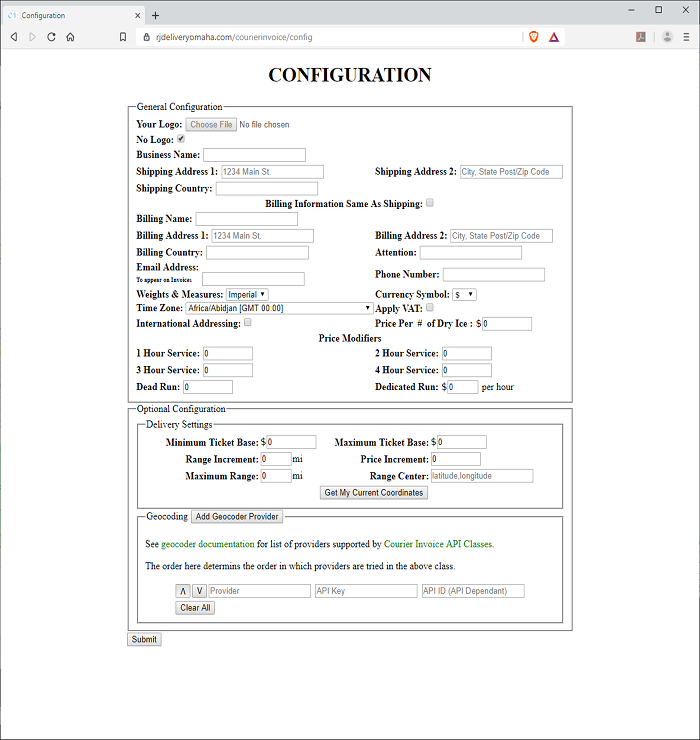 The initial configuration allows you to choose the logo that will be used on your invoices as well as set a modifier for 1 hour, 2 hour, 3 hour, 4 hour, and Routine (sometimes called same day) service as well as Dead Run (a discounted rate when there is nothing to pick up and the run needn't be completed, but the client didn't cancel) and Dedicated Run (priority runs billed at an hourly rate and calculated here to the second) cases. If you sell and deliver dry ice the base price per weight unit is set here as well. 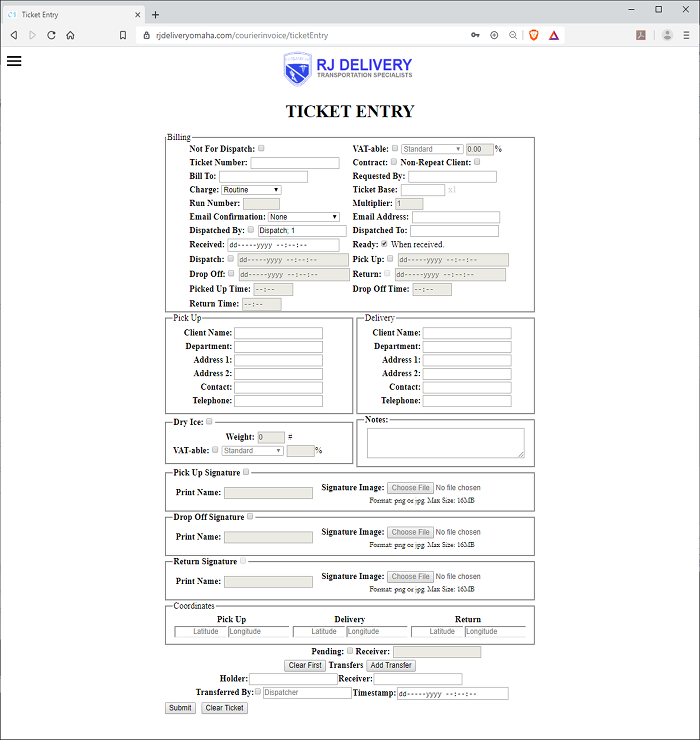 Optional configuration is available for minimum ticket fee, maximum ticket fee, range increment, price increment, and geocoder API keys that can be used in conjunction with our API to automate ticket generation. Once configured Courier Invoice does all the math for you. After configuring the first time all settings can be reset on the reconfigure page. 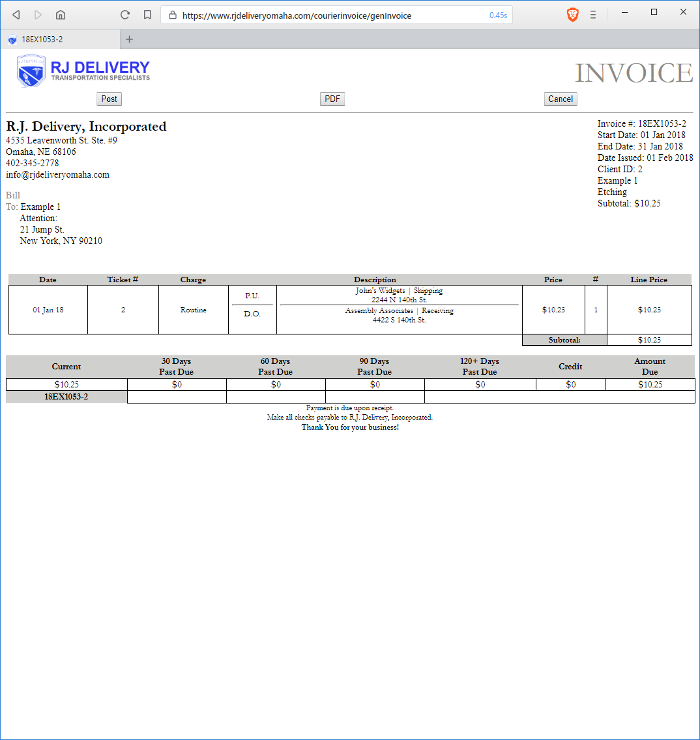 Courier Invoice makes managing clients easy. 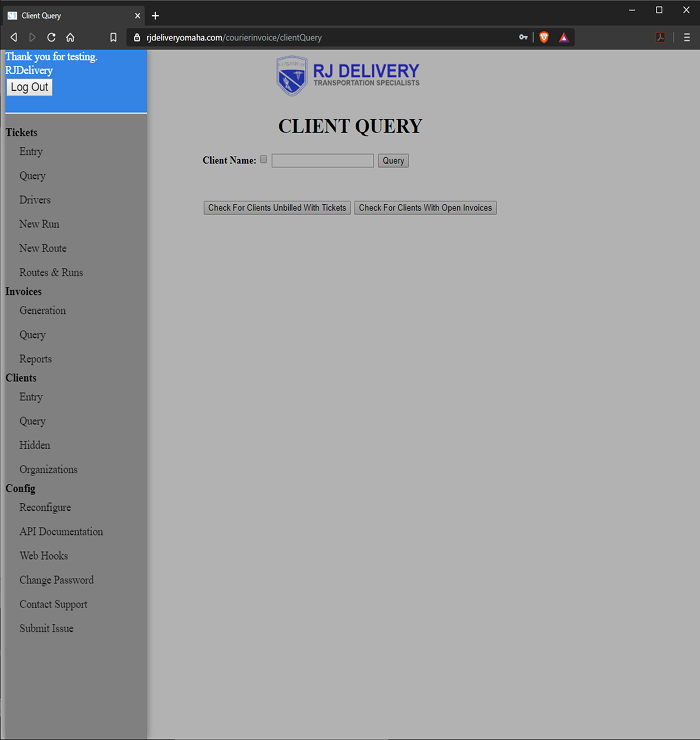 In one step enter a unique client ID number, the shipping address, and billing address if the two are different. Once entered clients can be queried and updated or deleted. If a client has tickets or invoices in the database they will be hidden rather than deleted. Hidden clients can then be removed, along with any tickets and invoices if desired. To avoid potentially cluttering lists clients are divided into two types, repeat and non-repeat. Additionally all clients can be grouped into organizations. 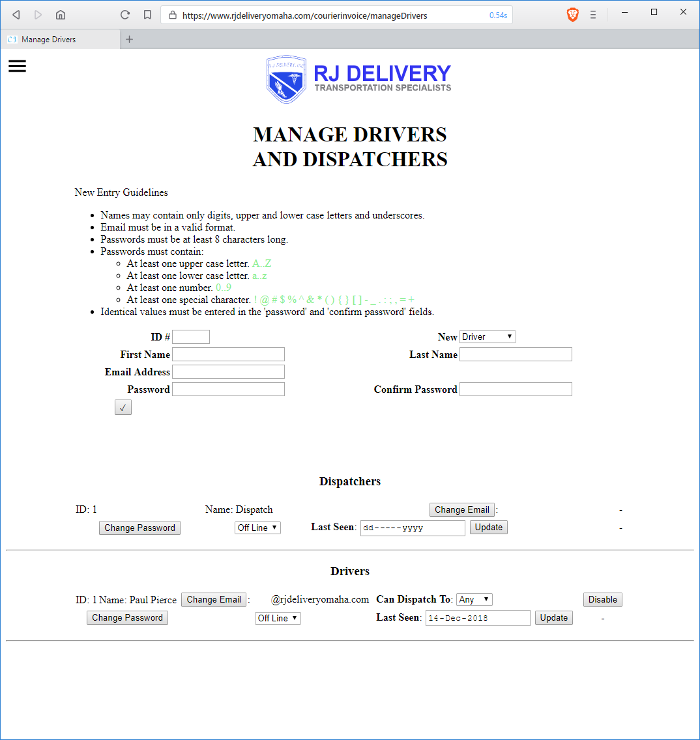 Similarly, on the Manage Drivers And Dispatchers page drivers and dispatchers can be created and drivers can be given dispatching access should it be needed in your operation. After clients, tickets can be entered. Each ticket number must be unique. 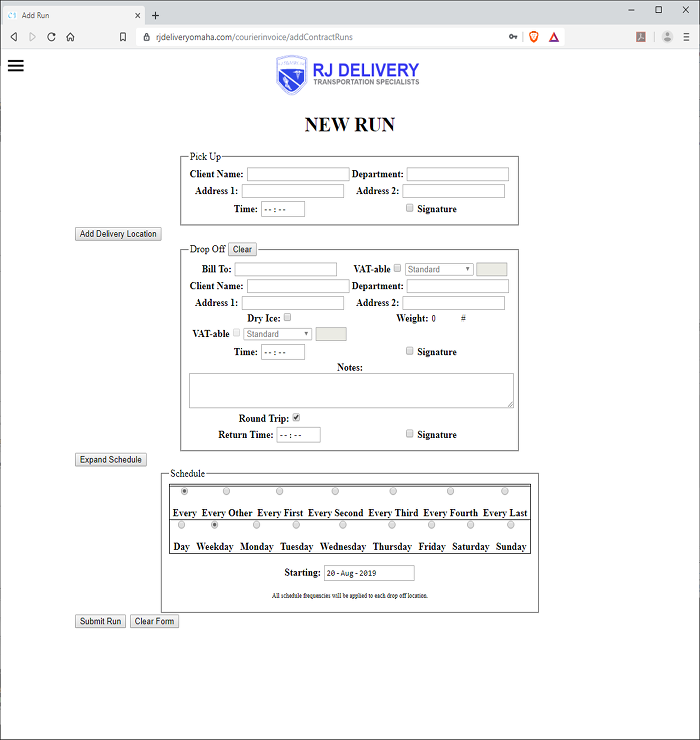 Contract runs, or runs that happen on a regular schedule, can be entered on the New Run page. After entering a run it can be edited on the Manage Runs page. This page also allows for the management of locations as well as the creation and management of rescheduling events. 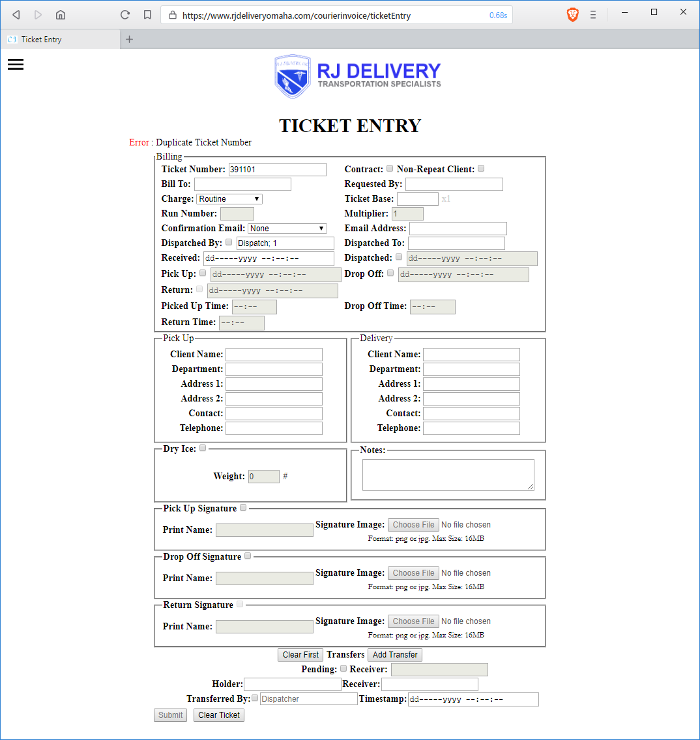 Doing this allows Courier Invoice to automatically fill out the ticket entry form for contract runs as well as build routes for drivers. Check the 'Contract' box and a ticket number will be generated. Additionally contract jobs can be given a multiplier to reflect the number of times the run was done in a given billing period or, if entered individually, they can be combined based on the run number when an invoice is generated. All active inputs in the billing section are required however, the 'Department' and 'Contact' fields in both the Pick Up and Delivery sections are optional. The charge field provides a drop down list of the different run types. If the client requests dry ice simply check the box and enter the weight. 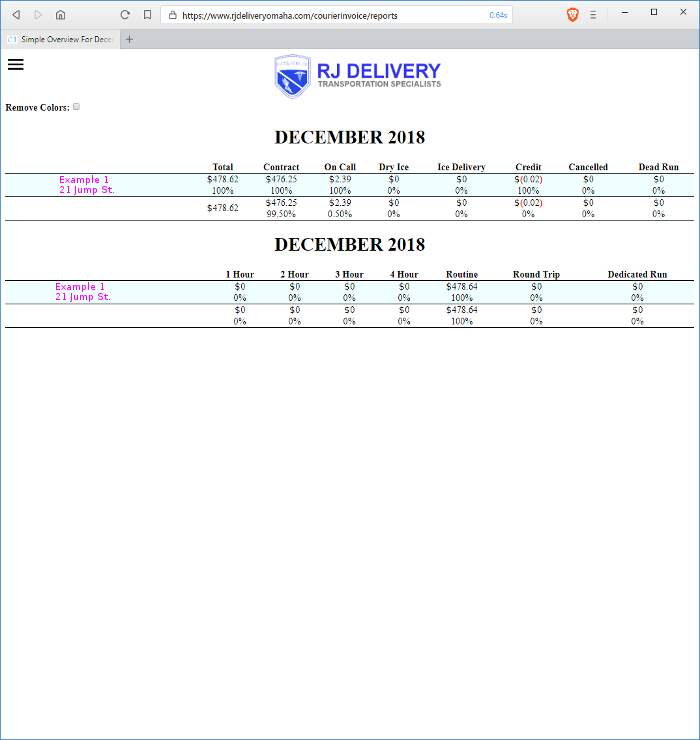 When it comes time to make the invoice Courier Invoice determines the total cost of the dry ice based on the values entered in the configuration. If any further details are required for the delivery a section is provided for notes. Tickets can be queried based on a number of parameters. 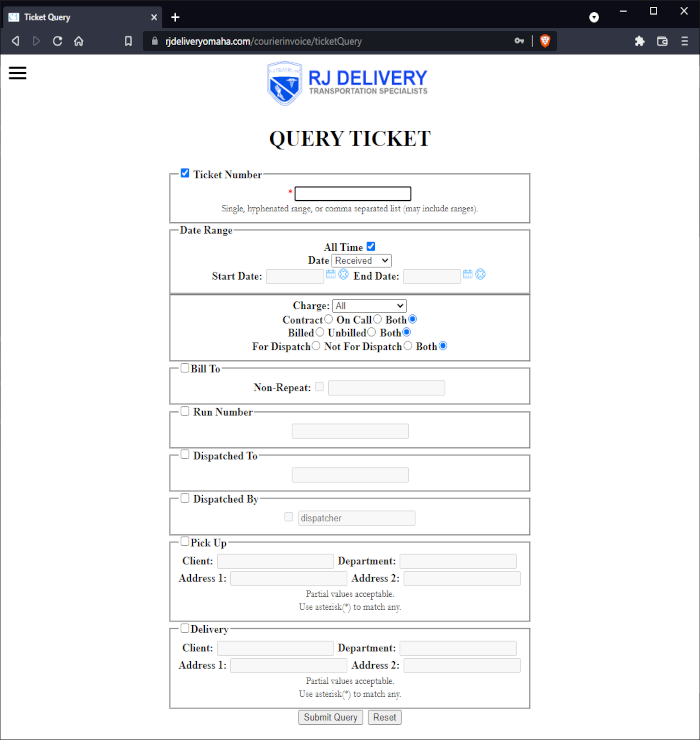 The query result is presented in an easy to read format with each ticket matching the query parameters shown as it's own entity with all associated information included. From this screen each ticket can be either edited or deleted unless it has been included on an invoice. In which case the invoice will have to be deleted before the ticket can be edited or itself deleted. Editing a ticket is identical to entering a ticket. 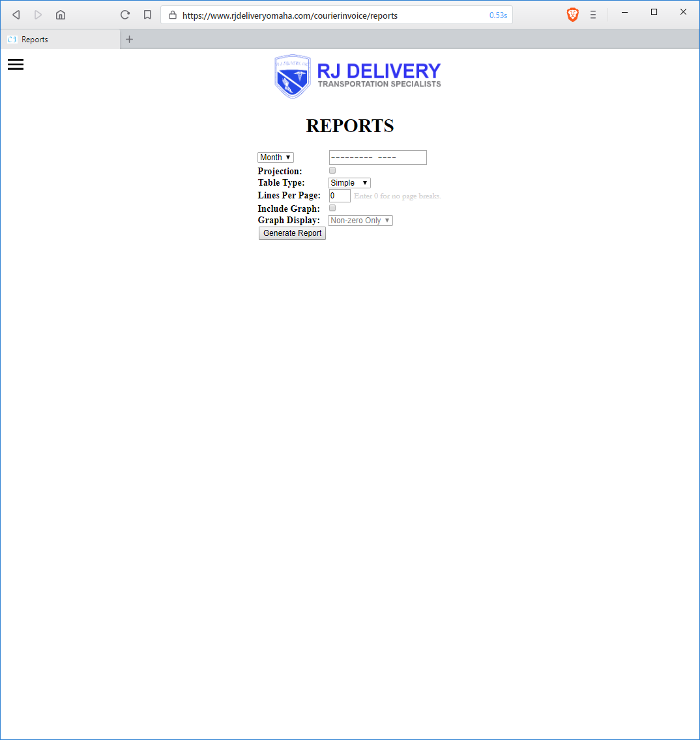 Creating invoices is a very simple endeavor. 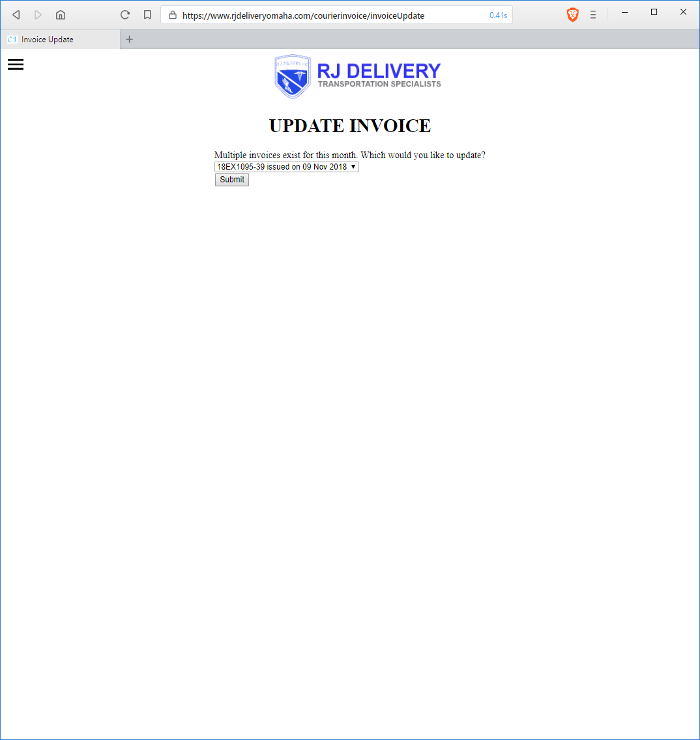 On the Invoice Generation page choose the the dates on which your billing cycle begins and ends, the date the invoice is issued, the client for whom to create the invoice, whether or not to include a copy of the tickets associated with the invoice, and click the 'Preview Invoice' button. The first invoice number for each client is randomly generated becoming sequential thereafter. At this point the invoice is not yet in the system. When printing the buttons will not be displayed and tickets are grouped two per page. Clicking 'Post' enters the invoice into the database and associates the tickets with the invoice number. After entry, invoices can be queried based on the client and the month issued or the invoice number. An extra selection step is added if a client has multiple invoices issued during the same month. From here invoices can be regenerated for reprinting or updated. 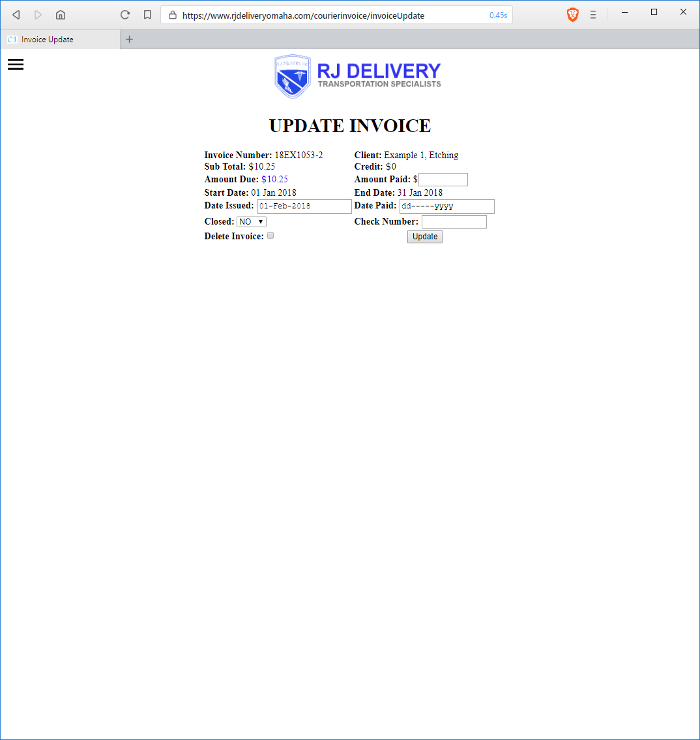 The Invoice Update screen allows for closing an invoice, entering how much was paid and the check number if relevant. 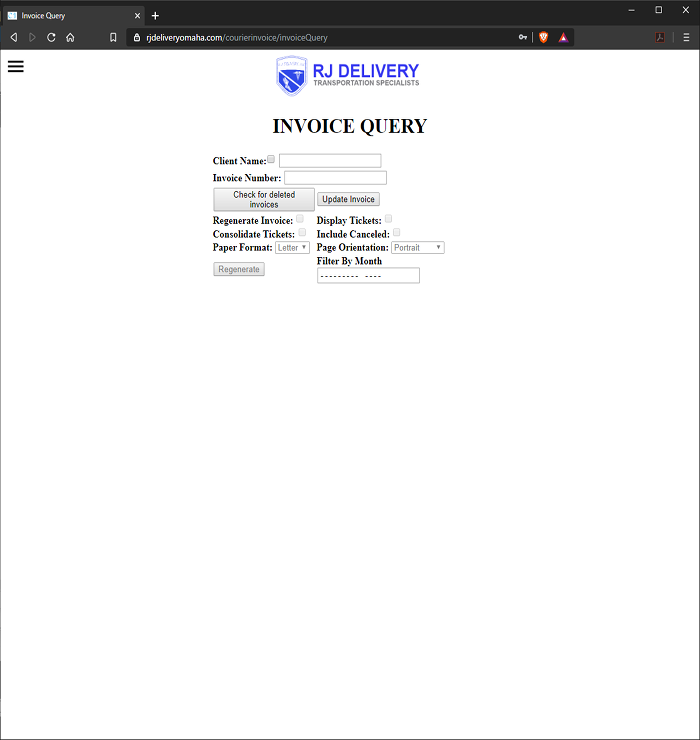 Also, invoices can be deleted from this page. 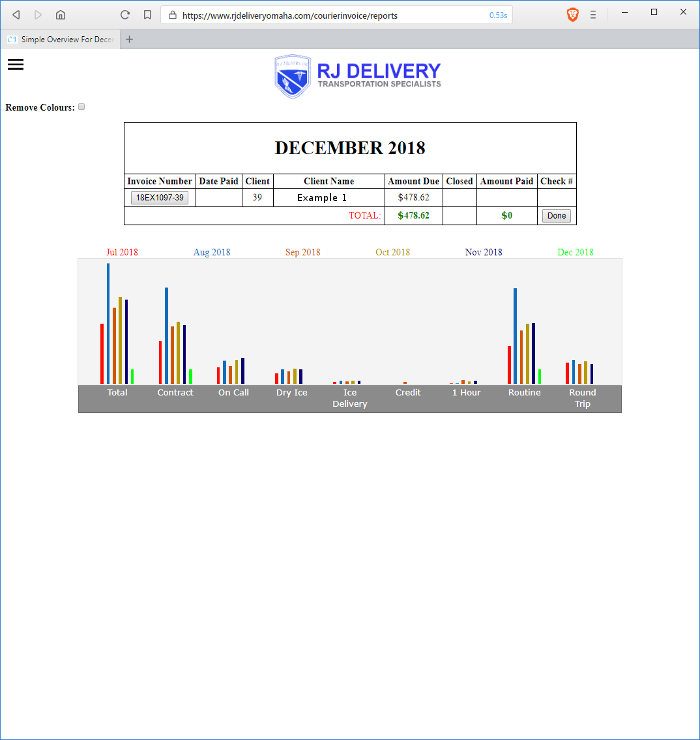 Finally, two types of reports can be generated to detail revenue for any given month or year that invoices were issued. A simple overview lists clients and invoices and a detailed overview listing total revenue and a break down by client and type of charge. This basic functionality is available for just $25 per month, $22.50 if you choose to pay automatically each month. For an additional $10 per month, $9 with automatic billing, you will have access to our API. API access can be added at any time.